Exilarch; born about 496; died about 520; ruled from 512 to 520. He was the son of Huna, who was appointed exilarch under Firuz; and he was born at the time when Mazdak endeavored to introduce communism in all Persia. The opposition against Mar Zuṭra, his imprisonment, and his early death have given rise to a number of legends. The following anecdote is told about his birth and the events preceding it: Mar Zuṭra's father was engaged in constant strife with his father-in-law, the school principal Mar Ḥanina, because the latter refused to obey the orders issued by the exilarch. Ḥanina was accordingly punished for his disobedience; and, being embittered and humiliated, he went into the prayer-house at night, and there shed a dishful of tears, whereupon he fell asleep. He dreamed that he was in a cedar forest, engaged in felling the trees; and when he came to the last cedar-tree King David appeared and forbade him to fell it. On awakening, Ḥanina learned that the entire house of the exilarch had perished, except his daughter, who was pregnant and had been spared. Soon afterward she gave birth to a son, whom the grandfather named Mar Zuṭra, at the same time assuming personal charge of his training. During Mar Zuṭra's infancy the exilarchate was administered by his brother-in-law Mar Paḥra, or Paḥda. The latter bribed King Kobad in order that he might remain in office; but when Mar Zuṭra had reached the age of fifteen, his grandfather presented him to the king as the legitimate ruler, whereupon the monarch installed him as exilarch. Mar Paḥda opposed this, but was killed by a fly which entered his nostril; and after that event the exilarchs had a fly on their seal. Mar Zuṭra took up arms against the Persians, and organized an uprising to oppose the introduction of communism, although the king himself was in favor thereof. The immediate cause of the uprising, however, was the assassination of the school principal Isaac, regarding which no accurate information exists. From the fact that Mar Ḥanina took part in the struggle, it may be deduced that it was of a religious character. At the head of a company of 400 Jewish warriors Mar Zuṭra advanced against the opposing Persian forces; and the battles fought by him have furnished material for various legends. It is told that a pillar of fire always preceded his army; and it is further stated that Mar Zuṭra founded an independent Jewish state, with Maḥoza as his residence. He ruled as an independent king, and imposed heavy taxes on all non-Jews. In spite of his able government, however, immorality spread among his people, whereupon the pillar of fire disappeared. In a subsequent battle between Mar Zuṭra and the Persians the former was defeated; and both he and his grandfather Ḥanina were taken prisoners and decapitated, their bodies being suspended from crosses on the bridge at Maḥoza. The account of Mar Zuṭra's life is based on a mixture of historic facts and legendary narratives. 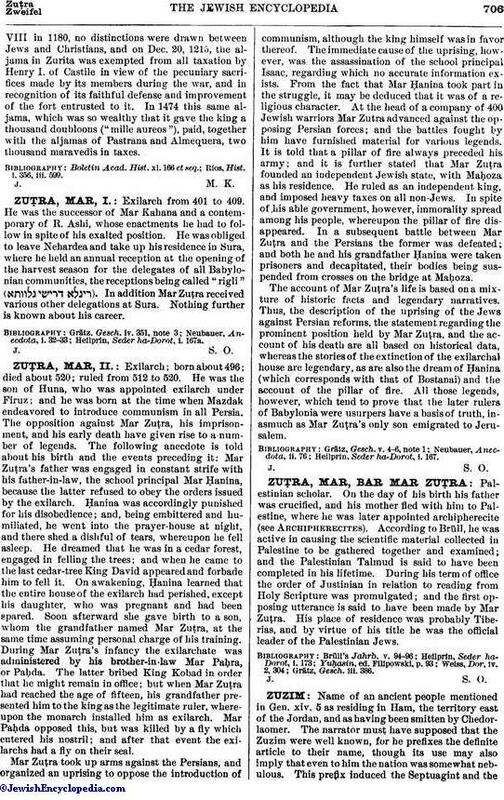 Thus, the description of the uprising of the Jews against Persian reforms, the statement regarding the prominent position held by Mar Zuṭra, and the account of his death are all based on historical data, whereas the stories of the extinction of the exilarchal house are legendary, as are also the dream of Ḥanina (which corresponds with that of Bostanai) and the account of the pillar of fire. All those legends, however, which tend to prove that the later rulers of Babylonia were usurpers have a basis of truth, inasmuch as Mar Zuṭra's only son emigrated to Jerusalem. Heilprin, Seder ha-Dorot, i. 167.